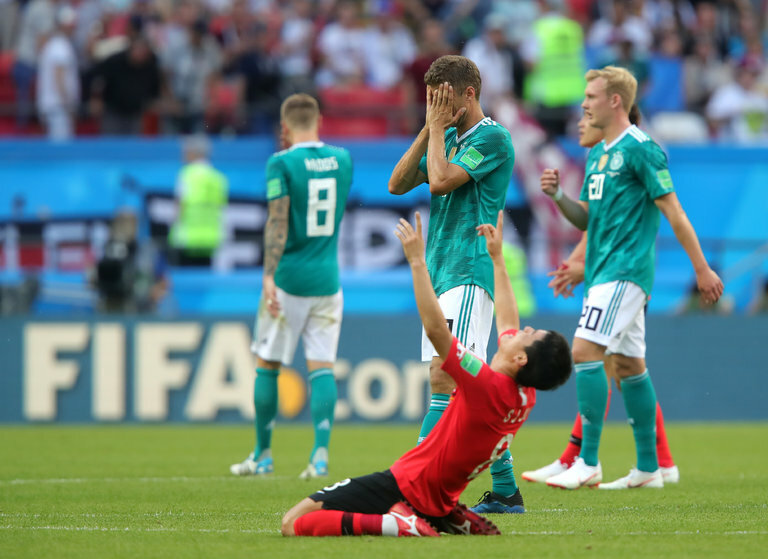 South Korea's upset victory over heavily-favored Germany allowed Mexico to move on to the next round of the World Cup, sparking fans of the two nations to become the best of friends. Okay, let's set the stage. Mexico, although 2-0 in the World Cup to that point, lost their last group stage game to Sweden on Wednesday. The loss meant, with a likely German victory, Mexico would be knocked out of the tournament. South Korea, without a point in the tournament so far, was a heavy underdog versus a stacked German squad who needed a win to advance. But an incredible effort from South Korea left Germany stunned with a 2-0 loss. A last-minute goal from South Korea put them up by two and sealed the victory. Mexican fans at home and in host country Russia erupted in celebration. And found some new friends to do it with. They hoisted a South Korean fan up by his arms and legs and jumped up and down in ecstasy. They gave one South Korean fan their own parade. Fans celebrating in Mexico City even stormed the South Korean embassy to celebrate with the consul general. This is some serious, next-level jubilation. Oh, and that chant in the last Tweet? It translates to: "Korean, brother, you're now Mexican!" Diplomacy in its finest form.